I remember it was a week after the 99 shotgun season opened. I knew it was the actually a week after because my significant other (Randy) got a nice ten point buck the first day of the season and now he was back at work. The only other person in the wood was our hunting buddy Rob. It wasnt that cold for hunting season about mid thirties. It had been in the 70s during the first week. I chose to hunt from the ground. It is something about being eye level with them that makes the hunt more exciting for me. I made my way to the woods, with my gun over one shoulder; I went to a wonderful spot. It was only about a quarter of a mile from my front door, on the edge of the hardwoods and a thicket on our land. It was pitch black and I had to set up my small chair and camouflage blanket, this happens most of the time during the morning hunts. Finally I got settled in and quite comfortable, then I witnessed the sun come up through the trees and send its powerful rays to make the maples come alive. After an hour or so, from the left of me he came. His head held high and focused on the path in front of him. I thought for a moment that I was the intruder here and this was his realm. Without too much hesitation I automatically kneeled behind the blind and readied my gun. I gave a short prayer to God as if was meant to be, he was a beautiful animal. I heard my heart thunder in my chest and pounding in breath. I lined up my sights and slowly squeezed the trigger. Its funny how time slows down after the fact, and you remember so many things from an instant and forget other things from that same moment. You dont think about how much a 12 gauge kicks, where the bullet hit, but do remember selective things; like the smell of the forest, the light through the leaves, or remember that I stood to see him running straight away and then an instant later, he stumbled to the ground. Sometimes I wonder what would make me do this to such a magnificent animal. Then it all comes back to me, in the woods, its peaceful, beautiful, and when Im hunting Im part of it all. 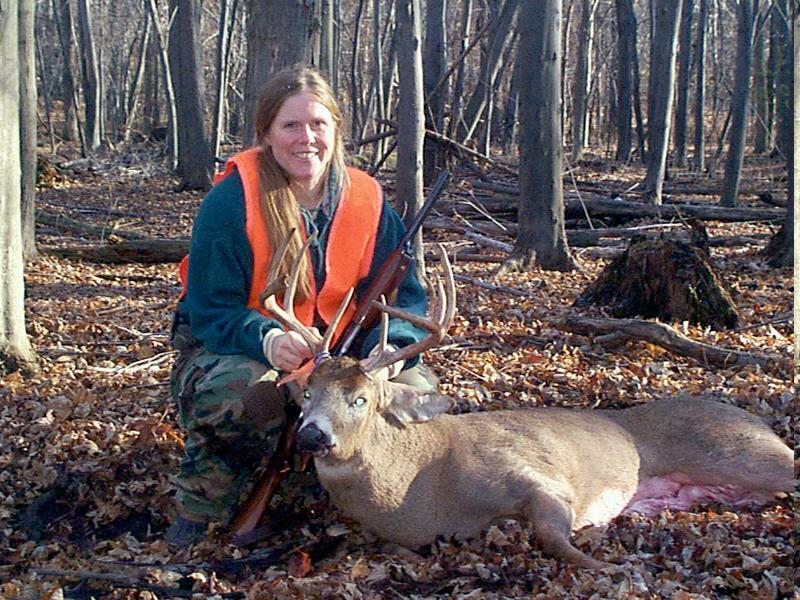 Im the hunter, Im a provider, this deer was my prey, and is now venison for my family.